This page includes Book Review columns from the 2003 issues of Across the Fence Post. Collectors eventually find a favorite stamp catalog to use to help identify, price, organize, and inventory their stamp collections. U.S. stamp collectors often choose between Brookman, Scott, Minkus and a few others such as the U.S. Postal Service guide (the only one in full-color). The 2003 Brookman Price Guide offers more than just a basic listing, with prices for used and mint. What amazes me about this catalog is the Brookman stamp company offers for sale each U.S. stamp in several grades and formats. An order form is included. This is a retail price guide. Thousands and thousands of stamps, covers, and stationary items are listed, priced, and offered for sale. I’d like to see the company’s inventory. It must be massive. The Scott catalogue started out as a dealer’s price guide, too. 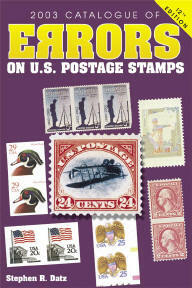 But Scott Publishing has long since ceased offering each stamp in the catalog for sale. The Brookman guide utilizes the Scott number system, a major advantage, as the other stamp catalog distributed by Krause Publications uses Minkus catalog numbers, which are much less commonly encountered in the hobby. Pages 1 through 96 list all U.S. postage stamps from 1847 to the 37-cent Neuter and Spay stamp. You might expect a concise listing, but Brookman does not disappoint. The page layout is two-column, illustrations identified by catalog number, with description and prices below. For each listing, the catalog specifies each available format (mint, used, plate block, sheet, booklet pane, and Souvenir Sheet) along with each variety (perforation, watermark, tagging, paper type, and printing method) for both single and se-tenant issues. I’m glad to see many varieties included. Brookman is not just a basic listing of face-different stamps. A “Definitive Issue Identifier” is included in the catalog’s introduction. It lists all definitives by denomination and color. (A 30-cent orange Franklin stamp could be catalog number 38, 71, 81, or 100 depending on perf., grill, and type). Other catalogs illustrate the different Classic U.S. types. Brookman attempts to describe the types. (Type III top and bottom lines are broken in the middle.”) For the Washington-Franklins, headings breakdown the distinguishing features, e.g. “1910-13 Coils Single Line Watermark Perf 8 1/2 Vertically.” Brookman lists the tagging varieties of the 1960s definitives and commemoratives. Printing varieties are listed for each of the definitive series, including my favorite Great American and Transportation coils. Illustrations are reasonably well done. Actual stamps are pictured, including perforations. The editor should seek illustrations without ragged and faulty perfs. A few recent stamps are scanned electronically and do not appear clearly. A few 19th century issues are illustrated with cancellations, some obscuring the stamp detail. If the company is offering unused stamps for sale, the catalog editors should have access to unused stamps for illustration purposes. Brookman offers Classic U.S. in Fine and Average grades. Very Fine and F-VF are listed between 1890 and the Farley issues. Afterward, only F-VF is listed. The Farley issues are also when Brookman begins pricing full mint sheets. The catalog is sold in both spiral and soft-bound versions. I recommend the spiral bound, which allows the open book to lay flat while I work on my collection. The catalog contains a few stamp dealer ads, tear-out reply cards, and even some coupons to save you money if you order more than $55 from Brookman. Six introductory articles provide some basics on the hobby and FDCs and topical collection. The catalog includes a great deal more than the U.S. postage stamp and usual back-of-book listings; year sets, plate number coils, booklets, unfolded panes, uncut press sheets, errors, stationary, revenues, Ducks, plus state and reservation Ducks. First Day Covers are listed on 42 pages (including Christmas seal FDCs and PNC FDCs). Next, the catalog has the trust territories, United Nations, and Canada. Autographs are an interesting sidelight to stamp collecting. Statesmen and celebrities are collectible on postage stamps and by autographed FDCs. Autographs are listed on pages 275-335. Everyone from John Kennedy $900 to astronaut Sally Ride to Gandhi $550 are listed. It seems the introductory articles about stamp collecting have not been updated. The listing of newspapers and magazines does not recognize that Mekeel’s and Stamps merged a few years ago. The bibliography’s first recommendation is the 1995 Scott Specialized. This is an impressive volume, well worth adding to your philatelic library. Its thousands of price changes will keep you up-to-date. As a comprehensive guide, you’re likely to find whatever you want to identify. The 2003 Brookman Price Guide is well-respected, well-recognized in the hobby, and easy to use. Besides, I’ve never met a philatelic book I didn’t like. The 2003 Brookman Stamps and Cover Price Guide can be purchased from stamp and hobby stores, major bookstores in spiral bound ($25.95) and soft cover ($20.95) or directly from the publisher, Krause Publications, Book Department PR02, PO Box 5009, Iola, WI 54945-5099, plus $4 shipping. Wisconsin residents please add appropriate sales tax. Contact Krause Publications at 800-258-0929, or visit on-line at www.krausebooks.com. The 2003 Ca talogue of Errors on U.S. Postage Stamps is a soft cover book in a 6 inch by 9 inch format which contains 185 pages of errors on United States stamps. The catalog numbers listed are unique to this catalog and are not cross referenced to any Scott or Minkus numbers. This feature might make it difficult for the first time user to find a stamp. Although, I found the fact that the different errors are listed in different sections and in chronological order it was rather easy to find the stamps. The final chapter “EFO’s and other unusual stamps” which covered imperfections stemming from freak occurrences during production such as, misperfs, foldovers, miscuts, etc. was also very informative. I liked that fact that price ranges were listed for stamps in each of these categories. Overall, I found the book to be very helpful and informative as a reference that should be in every philatelic library. It was tempting to do a comparative study of this catalog with another well-known American catalog, but I felt it better to let this reference book stand or fall on its own merits. A more meaningful comparison is between this very specialized volume and the U.S. section of an international catalog. Because this catalog is devoted exclusively to the postal issues of the United States, it stands to reason that more space is available for pointing up the distinctions between very similar stamps. For instance, the catalog identifies no less than 14 variations of the 1847 10-cent George Washington, the 2nd of our first two actual postage stamps. Another excellent case in point are the illustrations of the corner elements of the 2-cent stamps of the Bureau Issues of 1894, the type I and II variations of the 10-cent stamps of the same issue, and the 1894 Oliver Hazard Perry type I and type II variations found in the first One Dollar stamp. Material headed DECODING the Catalog is valuable. For those "collecting" U.S. stamps, this material may be "too much information," but for the philatelist specializing in U.S. stamps, the material is a gold mine of factual data probably not to be found anywhere else. I believe the values ascribed to stamps in terms of their actual market value are somewhat inflated. One example is the four hundred dollar value for the first Souvenir Sheet issued by the United States in 1926—the White Plains. While an unused Fine-Very Fine may bring that price, that is almost double what I have seen for the White Plaines Souvenir Sheets at bourses I have attended. Although the print is too small in some places, overall the book is well worth the price quoted by some dealers. 2003 Krause-Minkus Standard Catalog of U.S. Stamps can be purchased from hobby stores, major bookstores (ISBN 0-87349-473-3) or directly from the publisher, Krause Publications, Book Department PR03, P O Box 5009, Iola, WI 54945-5009, for $25.95 plus $4 shipping of the first book and $2.25 for each additional book. Illinois and Wisconsin residents must add the appropriate sales tax. Contact Krause Publications at (800) 258-0929, or visit online at www.krausebooks.com.